OKAY, so it's Holiday Movie Season: Take Two. Last weekend's hoped hits flopped to Earth, for the most part. Coming to the rescue, actual superheroes! 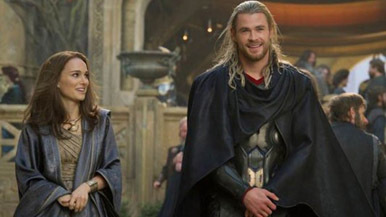 The next entry in the Marvel Universe is Thor: The Dark World, as Disney continues its march towards The Avengers 2 in 2015. It's a strange notion these ambitious projects have become, with hundred-plus million films serving as lead-ins. Such is the nature of things when you can earn $1.5 billion with the right plan. Thor was one of the more questionable films of Phase 1, as the character is less well known as a comic hero to the regular world, and the faux-Shakespearian dialogue raised eyebrows among people who do find this out. However, the first film wisely embraced the natural ridiculousness of the subject, with Kenneth Branagh filming the thing like a super-powered adaptation of King Lear. After a slower start, it proved to be one of the better performers of the Great Super Hero year of 2011, with about $450 million worldwide. The Dark World has already debuted outside North America, and has $110 million in its coffers – it's safe to say that $450 million may be dwarfed by just the international figures. But on to the movie. After the events of The Avengers, Thor returned to Asgard with Loki in tow, but now faces an even more dangerous enemy (played by Christopher Eccelston) with incomprehensible motivations. Better send Loki after him then, right? Natalie Portman's character returns also as Contractually Obligated Love Interest and to also be put in peril. The effects look as terrific as ever and the plot looks a little more understandable but also more epic (Thor was curiously contained in scope once it got to Earth – here's it's being set free to roam). So after the success of Phase 1, what do we expect from the followups? Iron Man 3 lept up from an already high mark to $174 million earlier this year and is 2013's clubhouse leader for box office with $408 million. Clearly, the Marvel movies have found their audience. The biggest challenge for the first Thor film was getting people to understand what to expect – now, with foreknowledge that there'll be a little humor, a lot of bashing things with hammers and a touch of beefcake, Thor: The Dark World should be an easy sell. Opening at a very summery 3,800 venues, this should be in line for about $82 million this weekend.